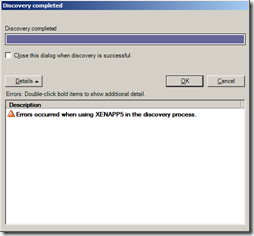 When opening the Citrix Access Management Console (AMC) you might get the error “Errors occurred when using <servername> in the discovery process”. 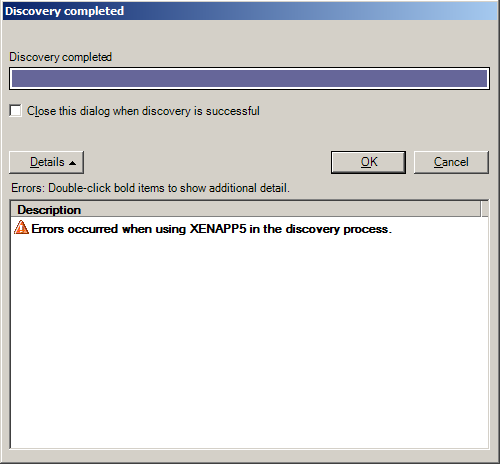 This is a typical error in a Citrix XenApp (5, 6 or Presentation Server 4.x) environment. There are multiple causes of this problem, some are more obvious then others. I’ve built a lab to run some tests on Citrix XenApp. Since this is a lab environment I do not have enough resources to create dedicated machines for each role. Therefore I found it justified to create a virtualized domain controller (dc001.domain.local) with multiple roles and multi-homed (Boooohhh, I know). The machine is not only a domain controller but also has the DNS and DHCP role. After creating a published desktop I’ve tried to connect from a machine in the 192.168.1.0/24 subnet. The session keeps waiting with the message ‘Please wait for the Local Session Manager’. WANem is (as the name implies) a WAN emulator that’s available for free and therefor ideal to use in a lab environment. WANem is built on the Knoppix distribution and supplied as a bootable ISO or a virtual appliance. Unfortunately the virtual appliance is only provided for the VMware hypervisor. I’ve got a lab built on the Citrix XenServer hypervisor and should therefore use the ISO. Installing (or actually booting) WANem is no rocket science, using it is a bit more complex. A guy named José Luis Gómez Ferrer de Couto has written an easy to understand tutorial (in Spanish) how to use WANem in Citrix XenServer. Unfortunately there is a small pitfall on my Citrix XenServer 5.6 machine, the network is unreachable. Citrix XenServer 5.5.0 is installed on a HP Proliant DL380 G6 server. The customer complained that VM’s experienced unexpected shutdowns without finding the cause of the problem. After spending some time troubleshooting on the virtual machines I couldn’t find the source of the problem. No BSOD on the VM’s, UPS showed no loss of power and there are no scheduled mechanismes that can cause the issue on the specified dates. Eventually I found that the cause of the issue is a bad driver as part of the HP Insight Manager Agent.